Recently Michael Abbott of The Brainy Gamer fame pondered a question that many would not: Why don't we talk about sport games? He then goes on to question why the more critically inclined out there don't spend some time focusing on these games, offers up a few potential reasons for the lack of discourse and then attempts to change it in his next post on MLB 09 The Show. For me the post came out of nowhere and before it, I didn't give sports games or their (lack of) discussion a second thought, but as soon as he mentioned it, it made absolute sense and inspired my own questions about my particular take on the genre. One half of this post is dedicated to my individual situation with the genre, the other shifts focus and turns the attention onto another genre that I feel is neglected in a similar way: Racing games. Recently I have been dedicating some posts to racing games in an attempt to not only summarise my thoughts on them, but also to try and look at them in ways that other, perhaps more casual players of the genre would not. I realise that not many people play the genre the way I do nor do they approach it in the same way and that's okay, everyone has their own tastes and interests, but as someone who enjoys it I can't deny that I would like to read more discussion about it. More on that in a bit. Whenever I see a game like Fifa or Tiger Woods in the charts, I am not surprised. Sports are popular, we all know that, so to see their virtual counterparts in the top ten games for a week, month or even year isn't shocking and is in some ways to be expected. 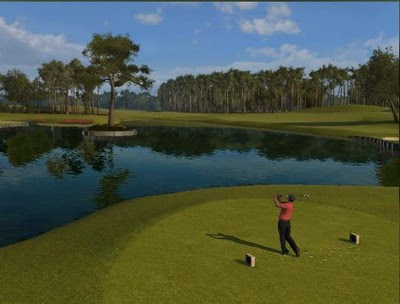 Add in Nintendo's simplistic yet addictive take on the genre in Wii Sports and it is almost guaranteed there is a sports game on the list somewhere. News that they can also outsell massively anticipated titles like Fallout 3 and Fable II combined does not surprise me either, not in the slightest. What does surprise me is that despite all of these people playing these games, there is next to no discussion (critically or otherwise) on them. Michael approaches it more eloquently than I ever could in his post, but my thoughts echo his own. Personally I have no problems with sports games and in an ideal world, I would be playing my fair share of them. Unfortunately though I do not have the time nor the finances to dedicate to sports games, especially not when I also have other titles (you know, the ones we do discuss) vying for my attention. Arguably, you could say that I view the sports genre as a lower priority when compared to the other, more commonly played ones. Meaning that while I do maintain an interest in them, they are usually cast aside so I can focus on the games I am even more interested in such as Fallout 3, Forza 2 and, of course, BioShock. This attitude towards the genre means that due to the aforementioned time and money situation, I rarely get to consider purchasing a sports game despite any desires of wanting to. That's just an unfortunate by-product of both the industry and my own life and it is something I have accepted over the years. Lately however, my interest in sport games has increased, particularly with the news of their quality increasing tenfold in recent iterations. To use the most obvious example, Fifa 09 was the first time that football (soccer) fans preferred EA's latest installment over Konami's most recent Pro Evolution title. That was interesting news purely because the Pro Evo series had built a reputation as being the king of football games. From all accounts, other games in the genre such as the latest Madden title are also of an increased quality in recent years and as such, it seems to me that the genre is now worth visiting if you are a fan of any sport. Continuing my own perspective for just a little longer, two games stand out to me in particular as games that should have been discussed more: Fight Night Round 03 and Rockstar's Table Tennis. Both games were surprisingly enjoyable for me (I'm not really interested in either sport) and yet despite their quality they flew under the radar. That's unfortunate and I can only hope that future quality sport games get their time in the spotlight. Racing games, while almost as common as First Person Shooters, seem to also be largely ignored by the critically inclined out there. As I mentioned above, I've been trying to change that a little with my own take on the various games out there, but even so I am just one person. Again I realise that not many people would share the experience and attitude towards the genre that I do, but even so surely some people out there are willing to read about and discuss racing games? I have no doubt that people play them (just like sport games) so why is there little to no discussion? In fact the only discussion I can think of in recent times (aside from reviews or interviews) related to racing games is conversation about Burnout Paradise and Criterion Software's incredible support of the game via downloadable content post release. While I appreciate that being discussed (it is respectable after all -- I can only hope other developers follow their lead), it's not really the game being discussed is it? It's Criterion's approach to downloadable content. What annoys me, as a fan of the entire Burnout franchise, is that this discussion only occurred once the DLC started happening; before that if you were going to hear something about the game it was complaints about a lack of a retry feature, or how some players were getting lost as a result of the new, open-world city. 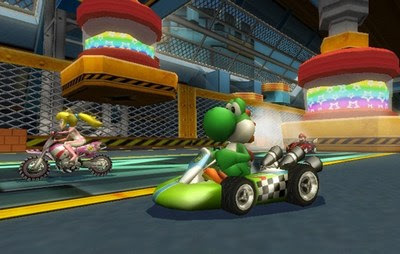 Positive and negative comments aside, it makes sense for games like Burnout Paradise and Mario Kart to be discussed as they are both accessible, easy to pick up and play, appeal to a broader audience and don't necessarily require any skill. Compare that to simulation games like Forza 2 and Gran Turismo and it's easy to see why there's no discussion on them. Yet, there is as well; both Gran Turismo and Forza 2 have their own communities (here and here) discussing everything from lap times to car setups to how they painted their car (Forza 2 only for that last one). This is a great start and for fans like me, it's awesome to be able to compare lap times with others around the world, try out someone's car setup or purchase someone's awesome looking car -- it feeds nicely into the car culture that I and many others are already well invested in, be it through an interest in particular manufacturers or motorsport like yours truly. But none of it is in-depth, none of it is critical and as someone who enjoys reading these particular perspectives, it is disappointing to see none of my favourite racing games be discussed in this way. On a semi-related topic, I have always found it interesting how racing games (particularly licensed ones which, in turn, are usually more on the sim side of things) are classed as their own genre. I understand why, but a lot of them are based around motorsport. See the bold for emphasis. Motorsport is indeed a sport, yet for whatever reason it is never treated as such. An interesting thing to ponder, perhaps. To conclude, now that Michael has brought it to my attention, I would like to see both genres discussed more often. There's no reason why they don't deserve the same treatment as RPGs or FPSs and I imagine that if people did approach them with a critical eye, some very interesting analysis and discourse would come out of it. I will continue to try and do my part with the racing genre, hopefully everyone else (if they have an interest in either genre) will also start to view these games as worthy of their attention. It seems to me that racing games receive a bit better treatment from the games press than, say, baseball games, but I'm guessing that's because more writers play games like Gran Turismo, Forza, and Burnout. The problem, as you say, is that very little of this coverage goes beyond boiler-plate reviews and announcements of DLC. The online communities are where the action is, and that's where you'll find serious, thoughtful commentary (and some over-the-top fanaticism too!). I think experiential writing requires a sensitive and personal approach, and maybe some games writers feel uncomfortable with that. I don't know. Thanks very much for the kind words about my work. I really appreciate it. First and foremost, thanks for stopping by again to make a comment and apologies for taking a while to respond. Racing games do get more content in magazines and on websites than sport games and I think that is because of a similar reason to my own (past) approach to the sport genre: that it is seen as less-important or a lower priority than the other genres. As for experiential writing, I agree. The personal approach is what makes it interesting but is also, perhaps, what makes it so hard for some to write about or try and understand/communicate. People like you, I believe anyway, are on the right track and as I've mentioned to you on Twitter before, you have an uncanny ability of putting games on my radar unexpectedly, thanks to the way you write about your experiences with them. Hopefully as more writers write about games, their experiential writing reaches a level that the author is confident and content with.